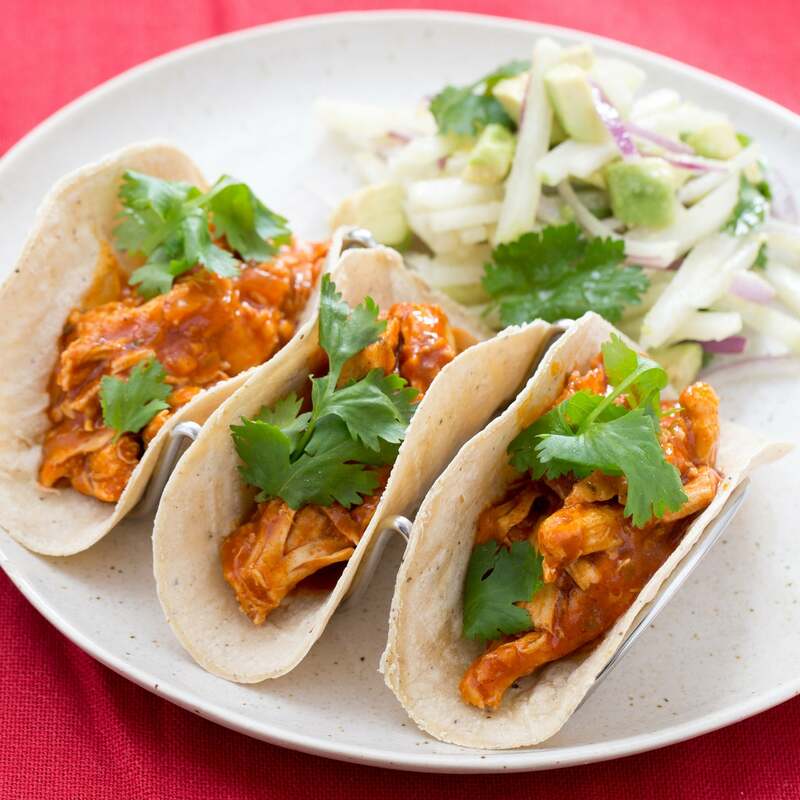 To give these tacos exceptional flavor, you’ll cook the chicken in a tomato sauce with our own special spice blend. Chipotle powder provides a little smokiness, while powdered ancho chiles bring the perfect amount of heat. Cumin and Mexican oregano add a complex earthiness and an lush zing. Dried orange peel ties the dish together with its subtle, citrusy sweetness. 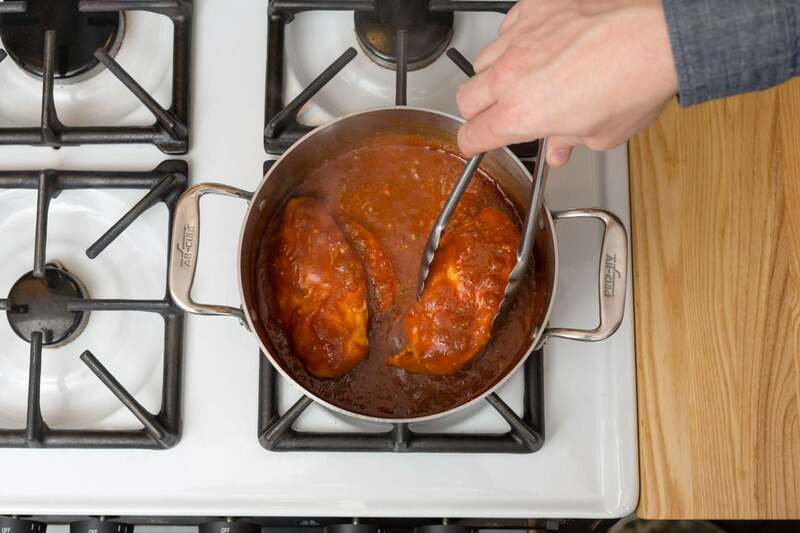 After cooking the whole chicken breasts in this sauce, you’ll pull (or shred) the chicken and add it back to the sauce, infusing it with even more flavor. Wash and dry the fresh produce. 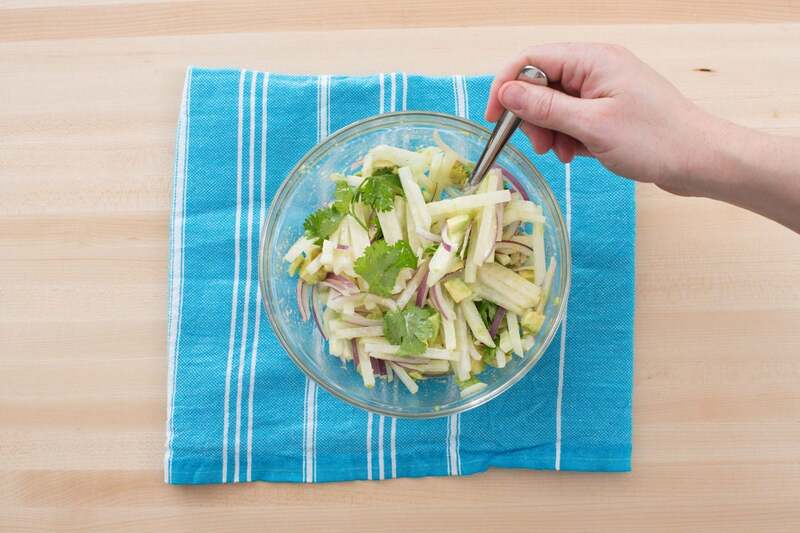 Peel and cut the jicama into matchsticks. Peel and mince the garlic. Using a peeler, remove the green rind of one of the limes, avoiding the white pith; mince the rind to get 2 teaspoons of zest (or use a zester). Quarter both limes. 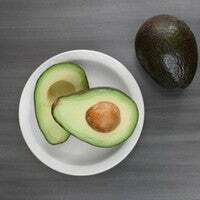 Peel, pit and medium dice the avocado; toss with the juice of 2 lime wedges to prevent browning. 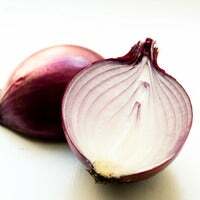 Peel and halve the red onion. Thinly slice one half; small dice the remaining half. 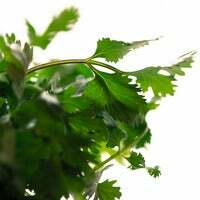 Pick the cilantro leaves off the stems; discard the stems. 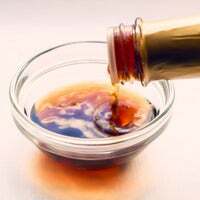 In a medium pot, heat 2 teaspoons of olive oil on medium until hot. 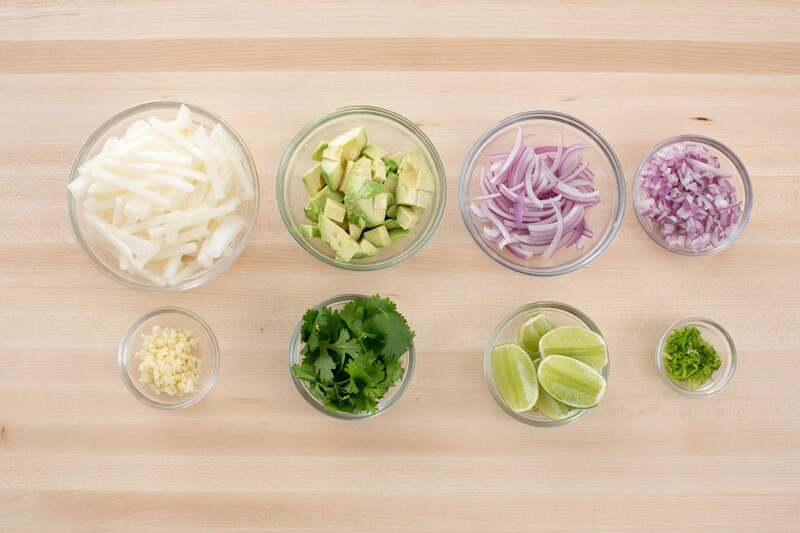 Add the garlic, lime zest, diced onion and spice blend. Cook, stirring frequently, 2 to 3 minutes, or until the aromatics have softened and the spices are fragrant. 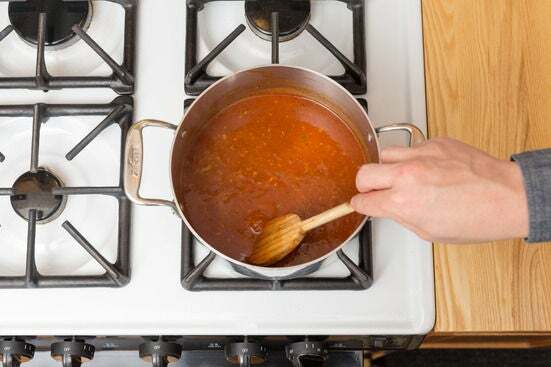 Add the tomato sauce and ¾ cups of water. Cook, stirring occasionally, 2 to 3 minutes, or until thoroughly combined and heated through; season with salt and pepper to taste. Season the chicken with salt and pepper on both sides. Add the seasoned chicken to the pot of sauce. Cook, flipping halfway through, 12 to 14 minutes, or until cooked through. Remove from heat. 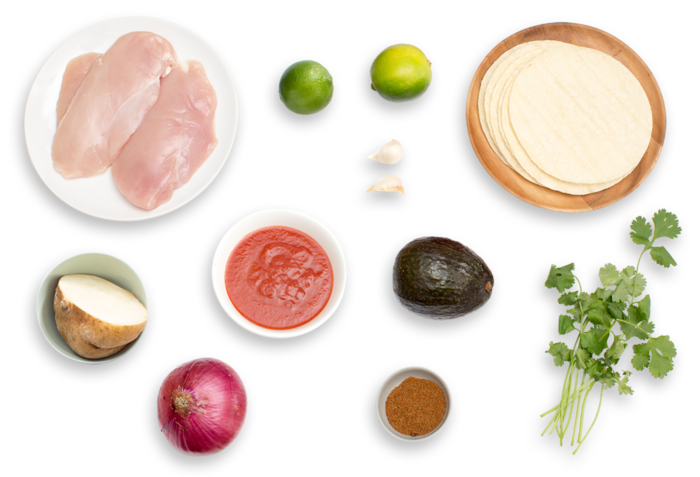 While the chicken cooks, in a large bowl, combine the jicama, diced avocado, as much of the sliced red onion as you’d like, three-quarters of the cilantro and the juice of 4 lime wedges. Drizzle with olive oil and toss to thoroughly combine. Season with salt and pepper to taste. Set aside. Transfer the cooked chicken to a work surface. Using two forks, shred the chicken. 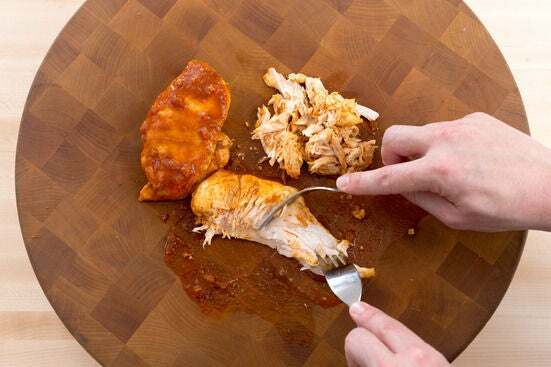 (Use one fork to hold the chicken steady on the cutting board. Use the other fork to tear the chicken into bite-sized pieces.) Return the shredded chicken to the pot of sauce and stir to thoroughly combine. Cover and set aside in a warm place. Heat a large, dry pan on medium until hot. 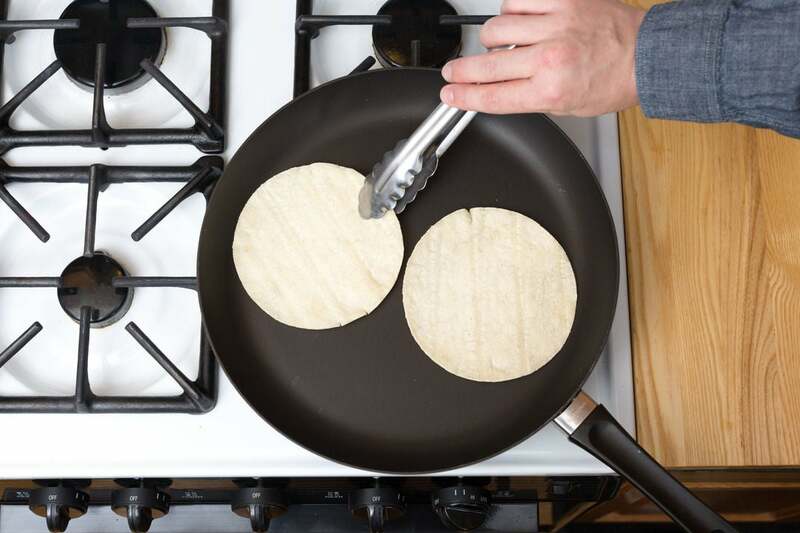 Working in batches, warm the tortillas for 20 to 30 seconds per side, or until soft and pliable. To plate your dish, fill each of the warmed tortillas with some of the shredded chicken. Garnish with the remaining cilantro. Serve with the salad and the remaining lime wedges on the side. Enjoy!